Payment Instructions: Payments by all successful bidders can pay by company check with letter of guarantee, cash, wire transfer. All successful bidders will receive their invoice via email from PPL the day after the auction sale. Taxes: All successful bidders will be responsible for sales taxes which will be added to your invoice unless an exemption certificate is supplied prior to invoicing. Refunds:No refunds or adjustments will be made once an item has been removed from the auction site. All refunds and adjustments are solely at the discretion of the auction company. Shipping Instructions: Rigging and removal is the responsibility of the buyer. Small items that can be carried out should be removed immediately after the auction or at the latest, the day after the auction. All riggers or buyers who will be removing items using any powered vehicle will need to provide a certificate of insurance that is acceptable to PPL. Removal may begin when the auction has been completed and payment in full received. If you need assistance please call us at our corporate offices @ 224-927-5320. 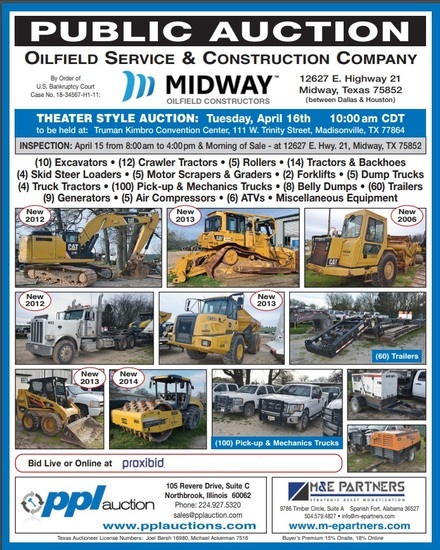 REGISTRATION & BIDDING: Everything will be sold to the highest bidders for cash, in accordance with the auctioneers normal Terms of Sale ', which are available at the site or by request at 224-927-5320. A 18% Buyer's Premium will be added to the final bid price. All bids are in US dollars. Your bid is a contract: Place a bid only if you are serious about buying the item. If you are the high bidder, you will enter into a legally binding contract with PPL Auction. PAYMENT: All successful Bidders agree to make full payment to PPL Auction at the conclusion of the sale. Only Bank Wire Transfer, Bank Check or Cashier's Check payable to PPL Auction, Cash will be accepted. Firm and personal checks accepted only if accompanied by a letter from your bank guaranteeing your funds. If you are using a wire transfer your bank may wire the funds the day after the sale. All sales are subject to sales and/or local taxes unless a signed exemption form is presented at the time of the purchase. Payment will be made in US dollars only. VERIFY DESCRIPTIONS: Note: Although all information has been obtained from sources deemed reliable, the auctioneer and seller make no warranty or guarantee, expressed or implied, as to the accuracy of the information contained in the auction brochure, lot catalog or sale web pages. Buyer agrees to accept assets purchased per standard auction terms, AS IS, WHERE IS, WITH ALL FAULTS ? WITHOUT ANY REPRESENTATION OR WARRANTY BY PPL AUCTION OR ANY OTHER PERSON. THERE ARE NO EXPRESSED OR IMPLIED REPRESENTATIONS OR WARRANTIES WITH RESPECT TO THE ASSETS INCLUDING, WITHOUT LIMITATION, ANY REPRESENTATION OR WARRANTY REGARDING THE MERCHANTABILITY OR FITNESS FOR ANY PARTICULAR PURPOSE. REMOVAL & RIGGING: Removal and Rigging is the responsibility of the buyer. Anyone, either a buyer or a rigger, who uses a powered vehicle to remove anything from the auction site, will be required to present a certificate of insurance. Removal may begin when the auction has completed and payment in full has been made. LOT: (4) Sets 3/4 in. Sockets, Ratchets, Extensions, etc. You've been outbid to d****4! to YOU! You've been outbid to e****n! to YOU! LOT: Large Quantity Combination Wrenches, etc. LOT: (6) Electric Drills - Dewalt, Porter Cable, etc.